Another psychedelic tapestry from Sunshine Daydream. Don't stare too long or you'll get absorbed into the infinity star design of the tapestry. This large tapestry is approximately 60" x 90". 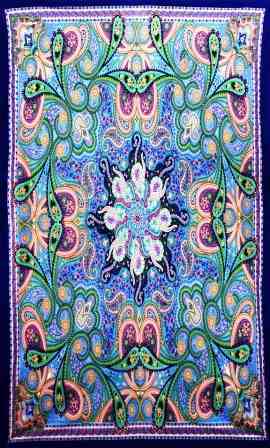 You can use this tapestry as wall hanging in your home or office, throw it over a couch, or as a bedspread on a twin bed. It would also look great in a dorm room. It is equipped with specially-designed loops to accommodate easy support from a wall, window frame, or ceiling.